As of this week, I’ve collected $28.69 in Lending Club loan repayments, which corresponds to $20.09 in principal and $8.95 in interest. Since I now have over $25 sitting in my account, it’s time to reinvest in another note. Regular reinvestment is an important part of maximizing your Lending Club returns, as your cash balance doesn’t actually earn any interest. What I didn’t realize until today, however, is that they make it extremely easy to reinvest as soon as you have enough cash on hand. As you can see from the screen below, there is a “Reinvest” link in the box along the right side of the main screen (see below). 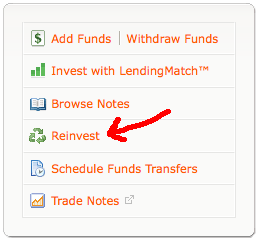 After clicking that link, you’ll be taken to a screen that lets you specify parameters for automatic reinvestment. Simply tell them the minimum cash balance that you want to accrue prior to reinvestment, your target interest rate, and how often you want them to contact you. Once you have everything set up, Lending Club will automatically pick out a basket of loans that matches your parameters and send you an e-mail telling alerting you that you have a pending reinvestment. All you have to do is click a link to approve it and they’ll fill your order. Very easy. Open your account today. I don’t know about their “basket of loans based on the % you want to earn”… I still would rather pick my own. Unless you go through their basket and make sure it fits your investing criteria…(and not just based on their computer models), my experience is better when I take the time to check out the loans they suggest. I actually filled out a spreadsheet that spans 30 years and reinvesting everytime I have a chance to do so. If I put in $100 a month and reinvest I came up with a number of $36000 out of pocket, but my assets after 30 years would be over $600k without taking into account defaults and assuming a return rate of about 12%. Does this sound about right to you? My apologies if I wasn’t clear. I’ve done really well with LC earning about 11% on my investment. 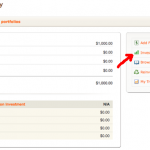 I’ve invested about $400 and continually reinvest the principal and interest earned. I know exactly why I earned very little on those loans but was just making the point that it may not be a 3 year loan. Borrowers can and do pay off early, which I say, good for them. I will continue to find loans that are worth investing in. Keep the borrowers coming! Patrick: You didn’t make much off those loans, but you only loaned the money for a very short period of time. All you have to do to keep things rolling is to reinvest in additional loans. I actually had two pay off their loans within 3 months of taking them. I made very little of those loans but it was refreshing to be able to help someone who needed it and see that they paid it back quickly. Bradley: The loans are sold as 3 year notes, so you’ll get your full principal plus interest back in 3 years unless you reinvest (assuming no defaults). 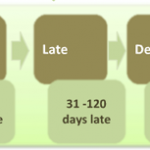 At that rate how long is it going to take you to get your initial investment back and be in profit?